Who said: "Second hand books are wild books..."
Virginia Woolf (1882-1941) was a British novelist, essayist, critic and a central figure of the Bloomsbury group*. She was educated at home by her parents - Julia Jackson Duckworth, a member of the Duckworth publishing family, and Leslie Stephen, a literary critic and founder of the Dictionary of National Biography. She experienced a series of traumatic deaths during her teens - first her mother died, then two years later, her half-sister Stella Duckworth, followed by the slow death of her father from cancer. When her brother Toby died in 1906 she suffered a prolonged mental breakdown - the first of many. 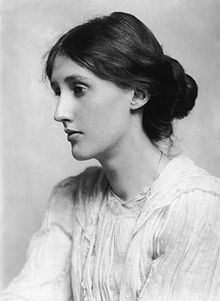 It was after the death of her father in 1904 that she, her sister and two brothers, moved to the house in Bloomsbury which would become central to the activities of the Bloomsbury group. In 1905 she began writing for the Times Literary Supplement; and in 1912 married the political theorist Leonard Woolf. Her first book, The Voyage, was published in 1915, but it was not until 1927 and the publication of To The Lighthouse, followed by The Waves (1931) that she established herself as one of the leading writers of modernism. In edition to her novels, she was also a prolific essayist, publishing more than 500 essays starting in 1905. By March 1941 her mental condition had deteriorated markedly. Unable to face another bout of illness she loaded her pockets with stones and drowned herself in the River Ouse near her Sussex home. *Named after the Bloomsbury area of London, the group included Virgina Woolf, Lytton Strachey, E.M. Forster, Vita Sackville-West, Roger Fry, Clive Bell and John Maynard Keynes. The group met from 1904 up to World War II. It started out as a social clique formed by a few Cambridge University graduates and their friends who met on Thursday nights for drinks and conversation. They were committed to pushing against the restraints and taboos of Victorianism on religious, artistic, social and sexual matters. By the 1920s their reputation as a cultural circle was established to the point that the groups mannerisms were parodied and Bloomsbury became eponymous for anything considered aesthetically insular or snobbish.